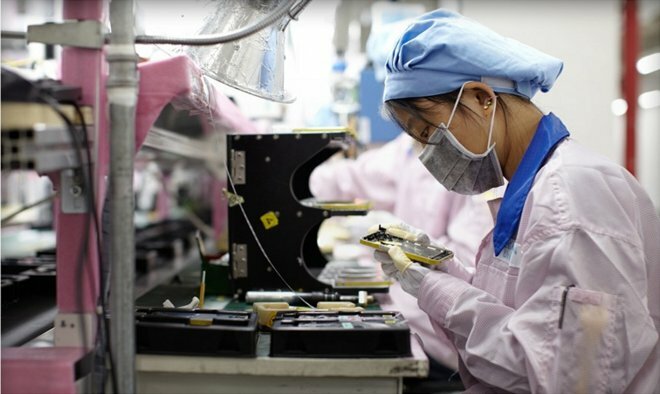 Apple's primary assembly partner, Hon Hai —better known as Foxconn —beat gross profit estimates for the June quarter, but in what may be a sign that the manufacturer cut costs to cope with weaker demand, a report said on Friday. The company's margin for the quarter was 7.2 percent, higher than an analyst consensus of 7 percent, Bloomberg noted. Net income was also slightly above expectations, up 27 percent to NT$25.7 billion, or $798 million. Analyst predictions averaged NT$25.2 billion (almost $783 milllion). Both the Chinese economy and the overall smartphone market have been slowing down, however, making it likely that Hon Hai/Foxconn used cutbacks to keep profits high. The company pulls in roughly half of its revenue from Apple, mostly through iPhone production. Although Apple set new internal records for the quarter, the 47.5 million iPhones it sold were below an average forecast of 48.8 million. Some analysts had been anticipating as much as 50 million. Foxconn and Pegatron are believed to be resuming their roles as Apple's main manufacturers for the next round of iPhones, which could be announced as soon as Sept. 9. Apple is commonly expected to reveal an iPhone 6s and a 6s Plus, but might also surprise with an iPhone 6c, which has been rumored as having a smaller 4-inch screen.